Replaces the Core i5 750 as our favourite gaming chip. No HyperThreading is a bit of a bummer. Speedier performance for more or less the same money is always welcome. That's exactly what you get from the new Intel Core i5 760. 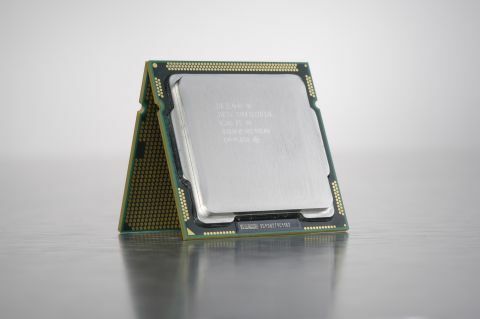 In almost every regard, it's identical to the existing Core i5 750 processor. It's therefore a quad-core chip based on Intel's 45nm Nehalem processor architecture. What it does offer, however, is a speed bump from 2.66GHz to 2.8GHz. Not exactly a spectacular explosion in performance, we admit. But then Intel is only asking for an extra fiver. In any case, even after a year on sale, the Core i5 750 is still an excellent all round performer. The slightly quicker Core i5 760 is only going to be better. The only snag is the arrival of AMD's new Phenom II X6 1055T beast. Six cores for a similar £150 or so price tag is awfully hard to resist.